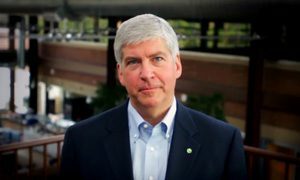 There wasn’t a lot of talk about environment during the race for governor, but Governor-elect Rick Snyder made it clear during the campaign that he thinks the state’s regulatory system is broken and said he wants fewer regulations on businesses. That has some people wondering whether that means there will also be fewer of the regulations that prevent pollution in the state. James Clift is here with me to talk about this. He’s the policy director for the Michigan Environmental Council. So do we know what to expect from the new governor? Clift: It’s a little bit of a clean slate here. In his victory speech he talked about protecting and promoting the Great Lakes. We think that’s a good thing. He talked about the importance of revitalizing our central cities, including the city of Detroit. We hope to work with him on that. I’m a little concerned about some of his comments regarding regulations but we’re willing to work with him to make sure that unnecessary regulations are limited but the ones that are designed to protect the Great Lakes and the environment, we need to keep those in place. There’s not only a new Republican governor, but the Michigan legislature is dominated by Republicans. They now have a supermajority in the Senate and a majority in the House. There’s this impression that Democrats tend to vote more favorably on environmental issues… has that actually proven to be the case? Clift: In general, you see some of the innovation and ideas over the years come from the Democratic side of the aisle, but we’ve seen kind of broad, bi-partisan support for protecting the Great Lakes and our natural resources. So in times when – and this isn’t the first time that Republicans have controlled both chambers and have had the governorship – we haven’t seen a steep erosion. But you know, you have to watch things like funding levels for the departments to make sure that the people who are out there watching over our environment are properly staffed and funded to do so. Some groups have expressed concern that a Snyder Administration would weaken protections on so-called factory farms. Do you think that’s likely to happen? Clift: Most of these facilities are under permit today. Where I fear is kind of on the monitoring side. You know, are we doing enough monitoring to make sure that when these manure sludges are applied to fields that they’re not running into our rivers and streams. Mr. Snyder said during the campaign that he would fast track permits for coal burning power plants. What would that mean for Michigan? Clift: That’s a situation where I think he really does need to look closely at where’s the innovation occurring, how much innovation are we seeing in the renewable and energy efficiency areas? We need to keep our transition to clean energy going, because I think that’s what’s putting Michigan’s manufacturing base back to work, not some short-term construction jobs for a coal plant that will end up obligating Michigan ratepayers to buy more coal from out-of-state sources for the next 40 years. During the campaign Mr. Snyder did express support for bringing more clean energy jobs to Michigan. Do you expect he’ll follow through on that? Clift: I think he will. I mean, I do think this is where a lot of the venture capital is going these days. You’ve got some people doing just amazing work across the state. We’re using our automotive know-how and putting it toward clean energy. So we’re producing parts for wind turbines at a cost below the Chinese. A lot of really exciting things going on in that area and a lot of jobs being created in that area and I think he has to do everything he can to foster those gains we’ve made. All right, well, thank you so much for your time. Clift: Thank you very much. James Clift is the policy director for the Michigan Environmental Council. That’s the Environment Report. I’m Rebecca Williams.